Photo tours of Pete Nelson's treehouses from Season 9 of Treehouse Masters on Animal Planet. 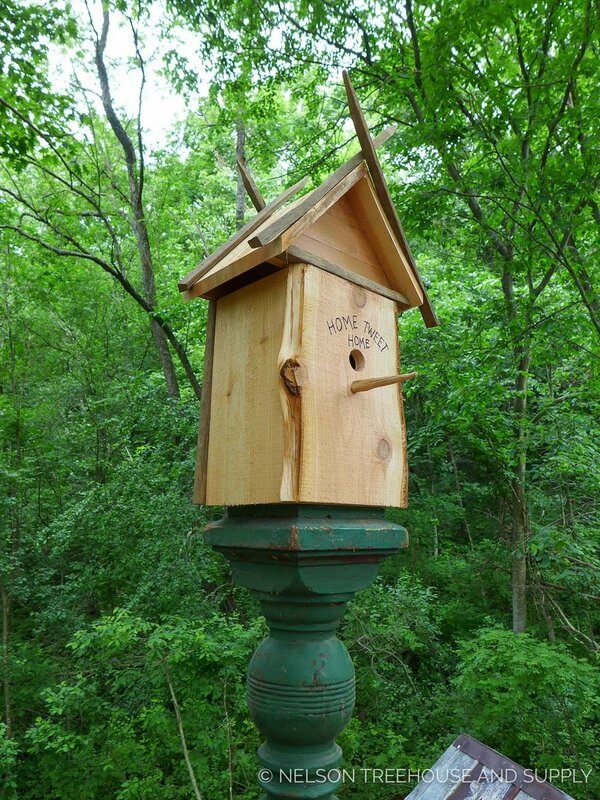 Building this birdhouse-inspired treehouse for Nancy S. and Nancy T. in Wisconsin was a real highlight of our year! Nancy S. asked Pete for a sun-filled studio where she could create artwork, while Nancy T. longed for a restful retreat. To fulfill both Nancys' dreams, Pete and the crew created three distinct pods in the same treehouse: two individual rooms and a central communal space, all connected via stairways and the ample deck. The crew integrated the Nancys' love of birdhouses into the design, imbuing the treehouse with a whimsical, "country-Victorian" style. 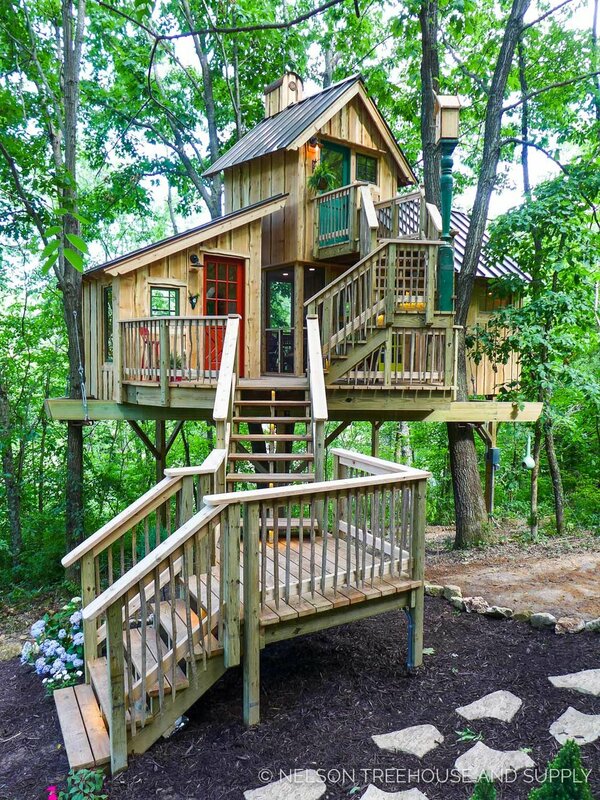 With its handcrafted cupola, "patchwork" walls of reclaimed windows, live-edge cedar siding, and colorful touches, this sweet treehouse has the rustic charm of a birdhouse built for humans. A combination of oak trees and posts supports the treehouse. At the lowest point of the slope beneath the platform, the treehouse rises about 15 feet off the ground. The crew integrated lots of reclaimed materials from the property, including doors, windows, and tobacco stakes for deck railing posts. Nancy T.'s pod is the first structure you come across after climbing the staircase. Live-edge cedar siding covers the facade. 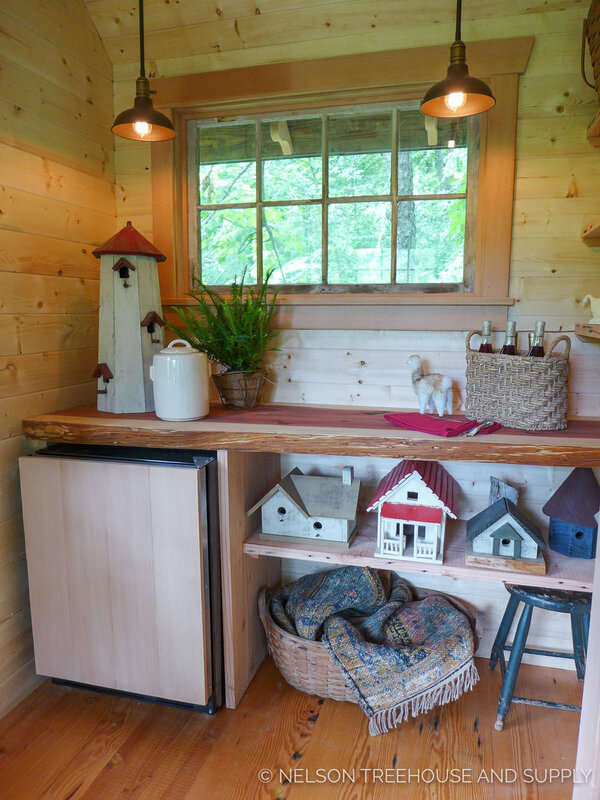 The inside of Nancy T.'s treehouse pod holds a built-in, live-edge slab desk and a cozy seating area. Windows frame views of the surrounding forest. 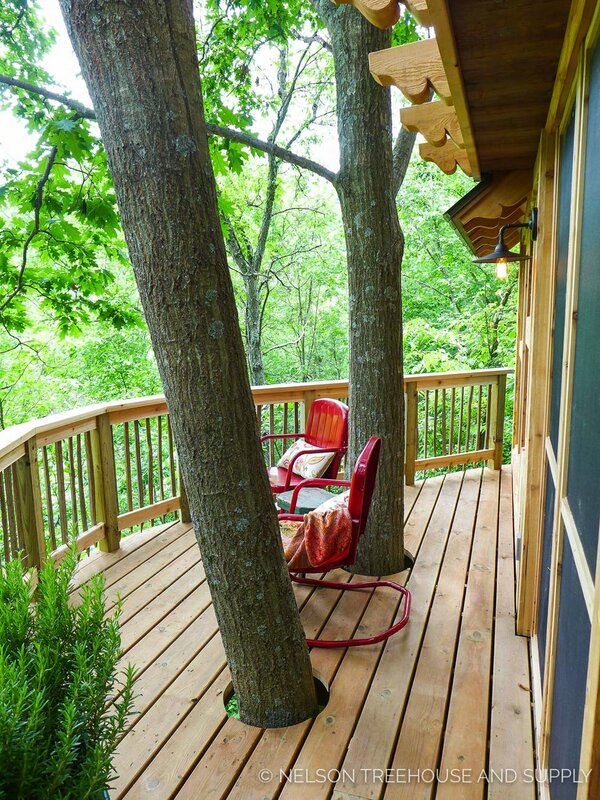 A roomy deck lies behind the central hub of the treehouse. Oak trees cut through the deck. The prefabrication crew added this charming rafter detailing. The central, communal pod holds a screened-in porch and comfy seating area. Reclaimed windows form a patchwork wall. Interior designer Christina Salway knocked it out of the park with furnishings that nod to the birdhouse theme without being over-the-top! To build this cool wall feature, our crew used reclaimed doors that Nancy T. and Nancy S. had collected. A kitchenette rounds out the communal space. 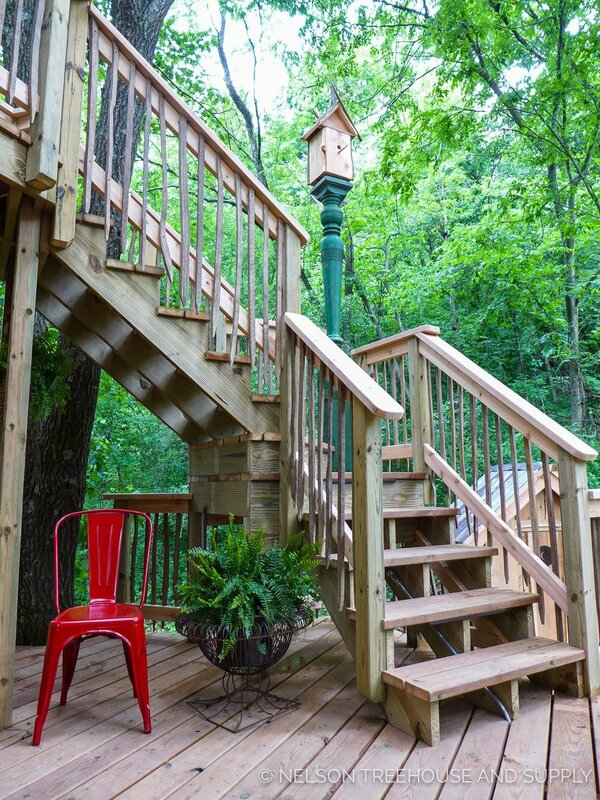 Another staircase leads to Nancy S.'s treehouse pod. Birdhouses pepper the property, so it was only natural to include one in the treehouse! Front door to Nancy S.'s art studio. The prefabrication crew crafted this unique cupola to top the treehouse. They used the same live-edge cedar that covers the facade of the structure. For the curved metal covering, the crew bent leftover corten on the prongs of a forklift! 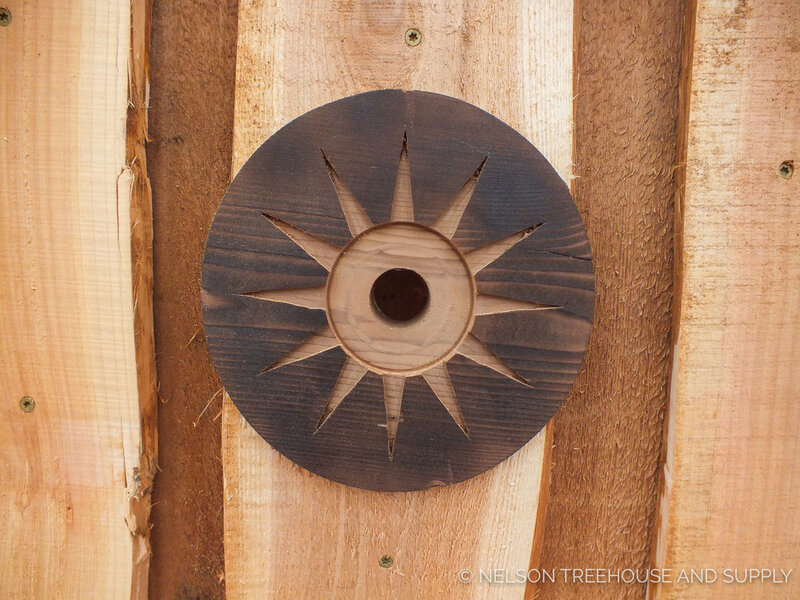 To craft this starburst, the crew cut a piece of cedar into a circle and then drilled out the center. They marked out the "rays" with a straightedge then applied shou sugi ban (cedar burning technique) to the wood. Using a trim router, they then cut out the rays and finished them with a knife. 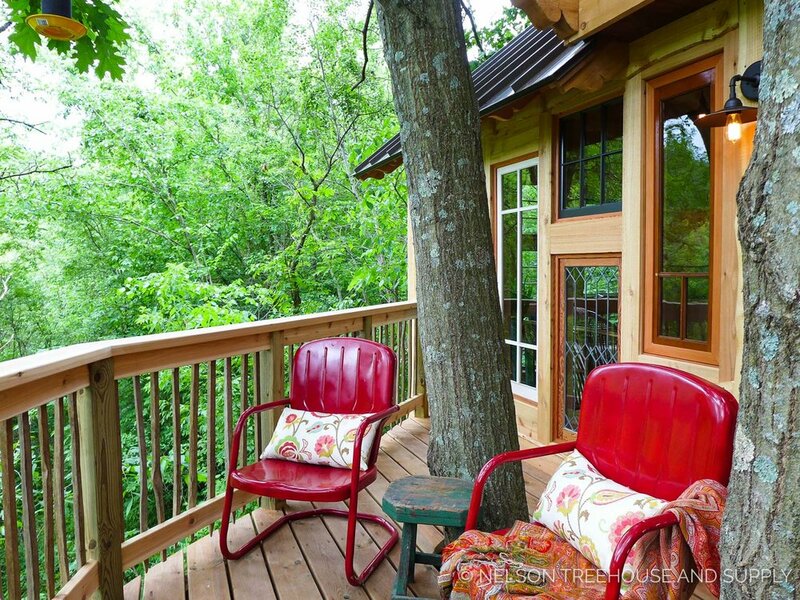 The inside of Nancy S.'s treehouse holds an ample desk positioned in front of a wall of reclaimed windows. The windows fill the space with natural light, making it the perfect spot for Nancy to create art. 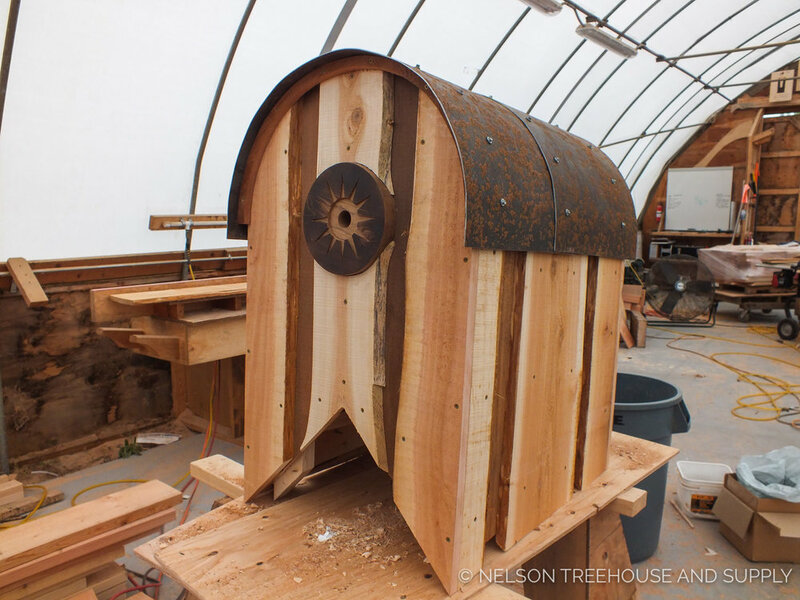 View of Nancy T.'s treehouse pod from Nancy S.'s studio. 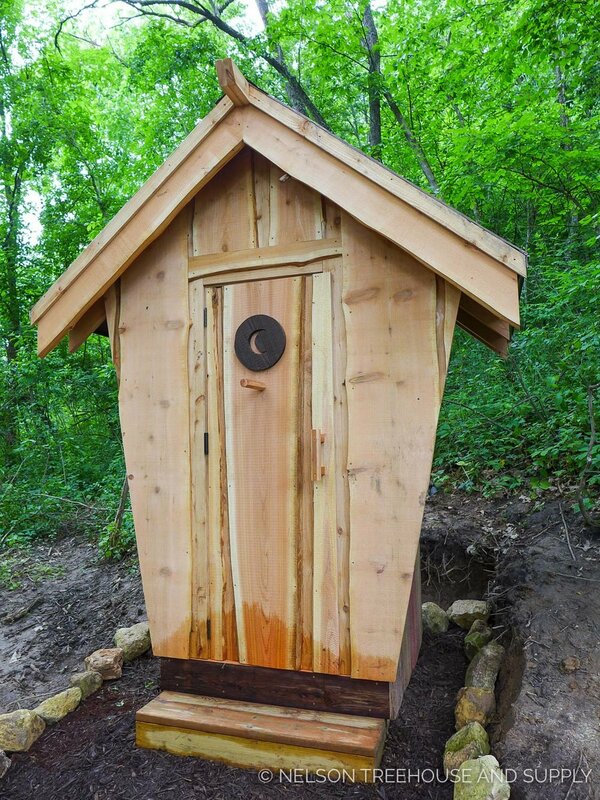 A small outhouse sits at the base of the treehouse. Its shape evokes a birdhouse. A unique, V-shaped tree supports the front of the treehouse. Thank you, Nancy T. and Nancy S., for such a joyful build! We wish you a lifetime of laughter, love, and relaxation up in the trees! To stay up-to-date on photo tours of treehouses from this all-new season of Treehouse Masters, subscribe to our newsletter and give us a follow on Facebook and Instagram.